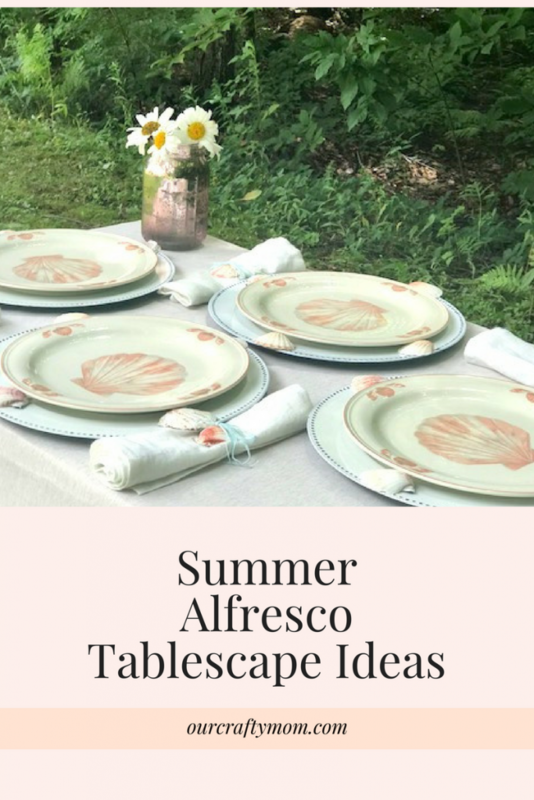 I’m thrilled to be teaming up with 19 talented bloggers to share Summer Alfresco Tablescape Ideas with you! 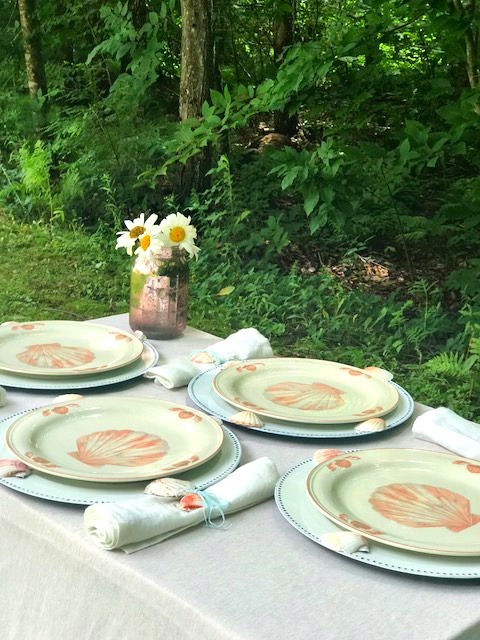 For my tablescape I used pretty sea shell dishes that I found at my favorite thrift store. You will not believe the price-4 for$1! Yup-you read that right. Can you believe it? That is why I love thrift store shopping. She is just as sweet as she is in her Facebook lives! Unfortunately the weather in New England has been awful all week. Not only has it been seriously humid, but we have been having thunderstorms off and on all week so I didn’t get to add the lights and a few other things I wanted. In fact, I barely set this up and it down poured. But thankfully I had taken a few photos just in time. 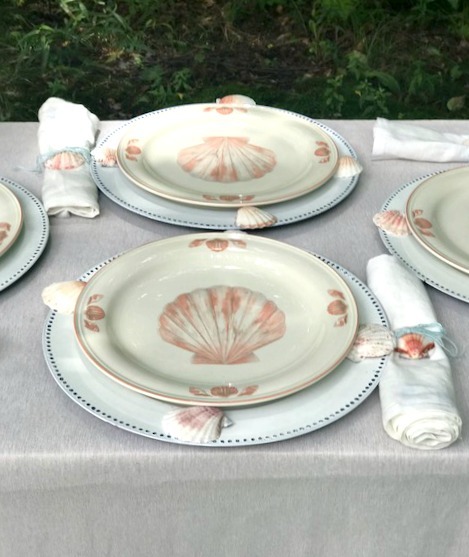 I kept it very simple and love the soft colors of the sea shell dishes. Just a few shells were added to the pearly white chargers and also tied to the linen napkins with bakers twine. The coral colors really pop against the neutral tablecloth. A metallic rose mason jar holds daisies snipped from my yard. I love the simplicity of this tablescape and it seems appropriate for a casual Summer dinner. One thing I always say with decorating a table is, it doesn’t have to cost a lot or take a ton of pieces to set a pretty table. A nice tablecloth, dishes and fresh flowers are really all you need. I will say I have a thing for linen napkins too! You can find great ones reasonably priced at Homegoods. There are so many incredible Summer Alfresco Tablescapes in this blog hop. Just click on the links below to see! You are in for a treat. Enjoy! I would have snapped up those plates in a heartbeat too, I love thrift stores!! Your table is so pretty. It has been too humid and warm here for outdoor dining, until the last few days. Our NC mountains have cooled off for a bit, with rain every afternoon, a welcome respite from the sauna it has been! Michelle, first , it was great to meet you at Haven. The shell plates are lovely and the shell napkins rings are really sweet. Glad you got your table set and photographed before the rain came. No, I can’t believe the price of those plates! We don’t get deals like that around here! I like how you added shells to a plain white charger and made shell napkin rings to add more texture, contrast and complete your theme. Daises were the perfect simple accent to your table. I think everyone has had trouble with the weather! Your sweet shell plates were a wonderful thrifty find. I am glad you were able to get some pretty shots of your table before the rain came down. I think most of us were dodging Mother Nature this week. I liked the photo of you and Chloe, it sounds like everyone enjoyed their Haven experience. Simplicity has it’s place for this lovely tablescape. The shell plates and napkins are so pretty. Adding the fresh flowers is a wonderful addition. I love your added shells to tie in with the plates. Great photo of you and Chloe. How fun to meet in person. 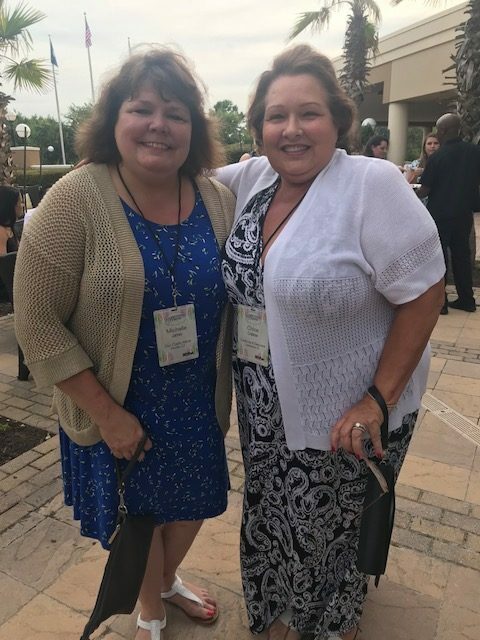 Hi Michelle, It was fun meeting so many at Haven this year and I enjoyed meeting you as we kept passing each other in the halls on our ways to classes. Your table is lovely. I like the way you incorporated the sea shells into your setting and the dishes were definitely a find. We, here in SW Florida have instantaneous rains and the most unexpected times so I feel ya. Great job. Great job, Michelle, on finding and snagging those dishes at the thrift store. You’re right, simple is best, esp when dining outdoors. Love that you had the chance to meet Chloe (and other, I’m sure) in Charleston. The virtual blogging community is special enough, so I can only imagine the thrill of solidifying the relationships in real life. Michelle, sorry to hear all my fellow tablescape bloggers are having such weather issues back home! Here in Iceland wind would be the likely culprit. What a find those plates were! I liked the simple charm of your table and it’s sweet color palette. What a great picture of you and Chloe! I love the china at your lovely table, it looks vintage so pretty! Michelle, I need to go shopping with you! Those shell plates are too cute and all for $1.00 is just unbelievable. Pretty, simple, and charming always works. The weather seems to have been an issue for all of us. But, we all have persevered. How wonderful that you and Chloe met at Haven. It is always a pleasure blog hopping with you! Pam Richardson recently posted…Drastically Changing It Up! What a bargain on those plates! You seem to be shopping at the right places at the right time! Your table is so pretty set agains the greenery of the woods (or what looks like woods to me). It was so much fun to meet you and then spend time with you at Haven. It doesn’t seem like we spent enough time…the weekend flew by, didn’t it? 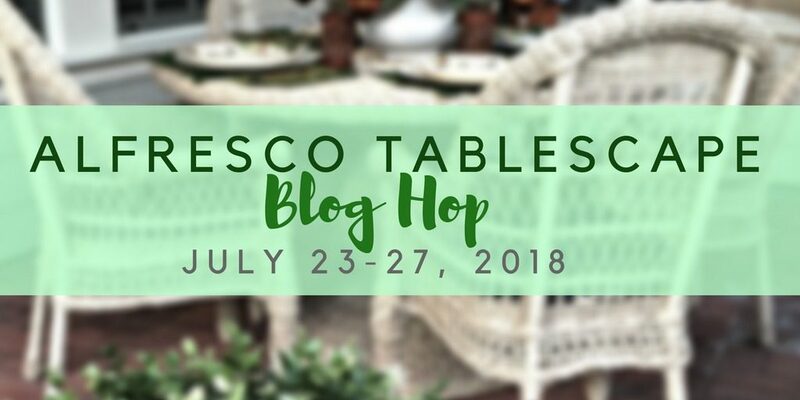 Thank you so much for your friendship and for joining in another tablescape blog hop! The simplicity of your table in your garden setting is just elegant Michelle. 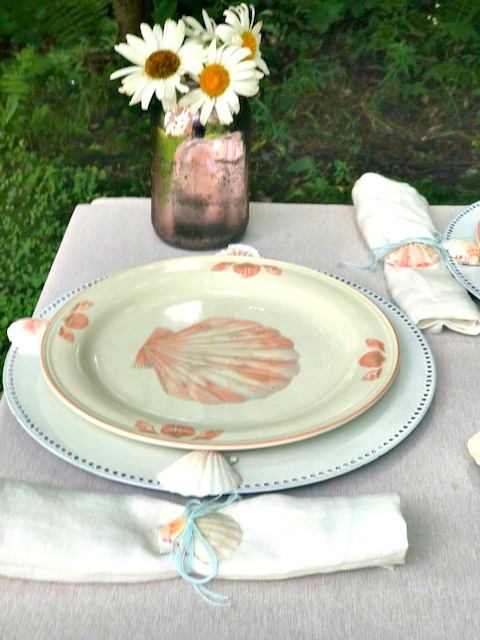 I love the pretty shell plates and embellishments and the soft color palette. I know what you mean about pop up showers, we have those often in the summer, and I am checking the weather minute by minute when setting outdoor tables 😂 I’m so glad you were able to fool mother nature and get your table ready! I am envious of all the fun everyone had at Haven, and Charleston is one of my favorite cities! Such precious plates and I also love, love the color of them! Two of my favorite places to be are the mountains and ocean. I am so happy for you and all of the other ladies that were able to connect at Haven. Haven is a very special event and filled with such inspiration and big hearts. It was so fun to meet you at Haven! I’m so glad we got to know each other. As for your tablescape, it is as lovely as you are! I adore that metallic mason jar, and adding the baker’s twine was perfect. I love the simplicity of it and the soft color palette. Good job! Michelle, I just love the simplicity of your table! 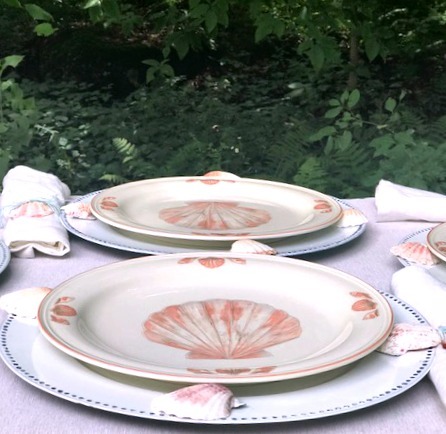 The soft pink of the shell plates is so pretty. The backdrop of the woods is perfection! Michelle, I love your coastal inspired table, especially because because of the coral colors!!! This post is such a nice showcase of beautiful tables, that offer a lot of inspiration. This is such a beautiful table with its soft colors. Your new plates are so pretty and are perfect for an alfresco table! Wow, what a steal of a deal, you won’t find anything near to that here. Hopefully, your weather improves. Your table setting is beautiful as always, I really love your tablescapes.